December 5, 2017 (Decatur, Georgia) -- DIFFERENT TRAINS GALLERY (432 East Howard Avenue No. 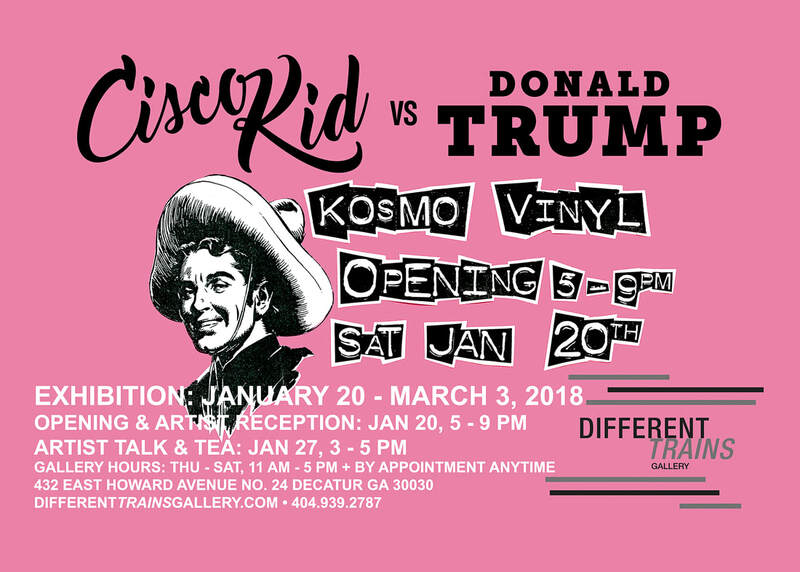 24) will welcome London-born/New York City-based artist Kosmo Vinyl back to town on the one-year anniversary of the presidential inauguration, for the opening of the "Cisco Kid vs. Donald Trump" exhibition. The artist’s reception will take place on Saturday, Jan. 20, 2018, from 5 - 9 p.m. and the show continues through March 3. 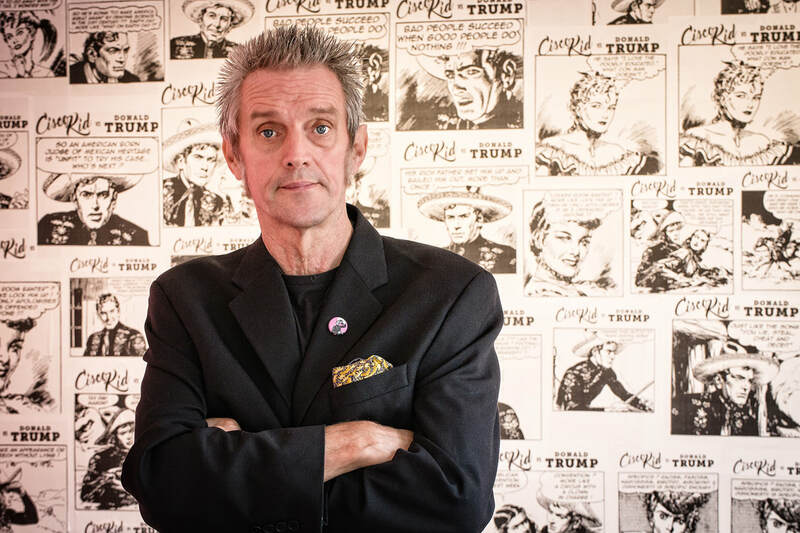 Creative Protest is nothing new for the artist, whose former career started in 1970s London working with seminal British punk band The Clash. Kosmo emigrated to New York City 30 years ago and eventually retired from music to raise a family. His art career began almost by accident when he started making his own postcards and mailing them to friends. 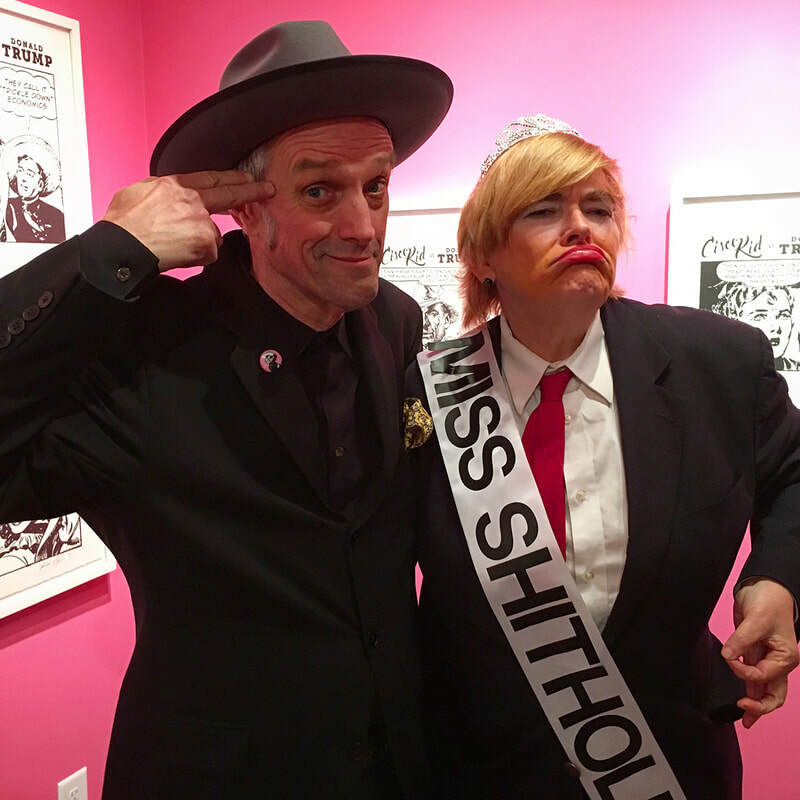 An exhibition of his 'mail art', in collaboration with Georgia artist/musician Jack Logan, was shown earlier this year at the Lyndon House Arts Center in Athens. When then-candidate Trump first announced that Mexican immigrants were drug dealers and rapists, Vinyl’s outrage sparked a brainstorm. 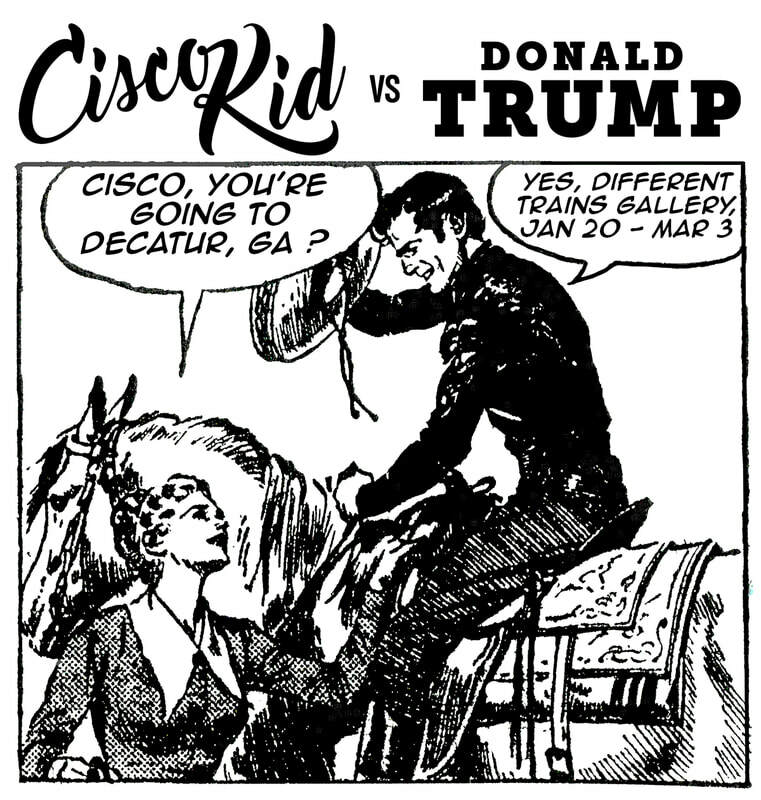 “Cisco Kid was a caballero, the Robin Hood of the West. Who is better to defend the good name, not only of Mexicans but all immigrants?”, he thought. The Instagram series was started with the expectation of finishing after the election in November, but when the results came in he realized people needed Cisco to ride on now more than ever. The first digital image was converted into tangible art at the 2016 AJC Decatur Book Festival, where Vinyl worked with the Atlanta Printmakers Studio to make hand-pulled screenprints on site. When he was asked to exhibit at the SPRING/BREAK Art Show during New York Armory Week in 2017, he had high-quality pigment prints made and framed for the fair. The installation captured the attention of MoMA PS1 Director Klaus Biesenbach and received coverage in ArtNEWS, The Inside Report and W Magazine. He then took the show to the belly of the beast, making his Washington D.C. debut at the Gallery at Lost Origins Productions in October. The Washington Post wrote: "It’s as though the Clash reunited to challenge Trump, not with songs but with record covers.". 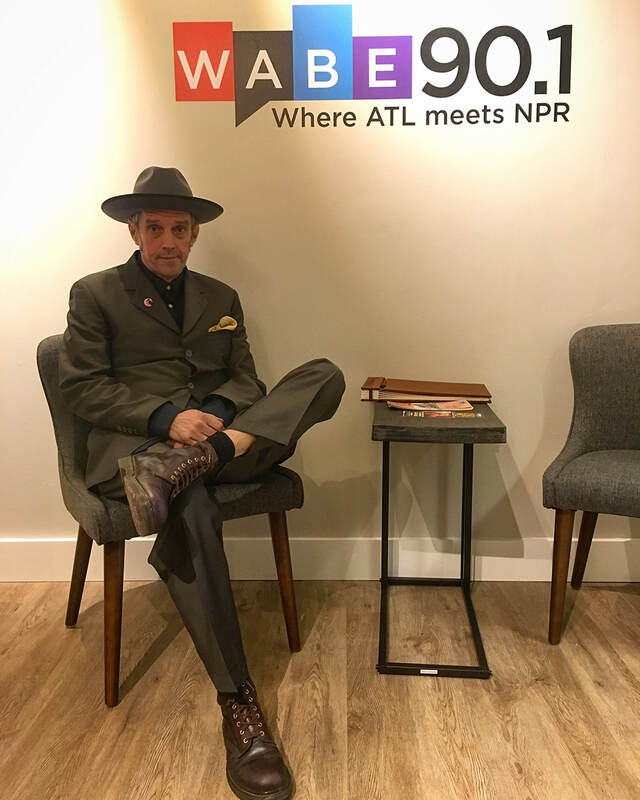 Gallery Director Shawn Vinson is delighted to bring Kosmo Vinyl back down south, having presented the artist's US debut exhibition in 2014. “I grew up listening to the Clash and have made a career of promoting contemporary British artists, so befriending and working with Kosmo has been an absolute privilege and pleasure.” A week after the artist’s reception on January 20, the gallery will host an artist talk (with tea) on the afternoon of the 27th. The exhibition will continue through March 3.